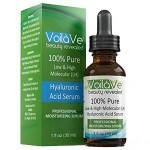 Azure Naturals Ultimate Hyaluronic Anti-Aging Serum Reviews: Works? Azure Naturals Ultimate Hyaluronic Anti-Aging Serum uses vitamins, botanicals, and hyaluronic acid to make your skin look younger. Hyaluronic acid is a humectant, meaning it binds moisture to itself, filling in fine lines and wrinkles and leaving a dewy glow behind. Vitamins C and E boost collagen growth, brighten dark spots, and protect your skin from the free radicals like UV rays. The company claims this product is made with the highest quality ingredients available. Azure Naturals produces skincare products created with all-natural and organic ingredients. They are very environmentally friendly, and all of their products are animal cruelty free. 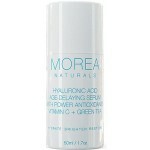 To use this product, wash your face and pat dry before massaging a small amount of the serum onto the face and neck. Allow product to dry before adding makeup or another moisturizer. 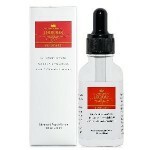 Azure Naturals Ultimate Hyaluronic Anti-Aging Serum comes in two sizes. The 1 oz. bottle is $15.88 and the 2 oz. bottle is $25.88 from the manufacturer. You can also find this product on Amazon. 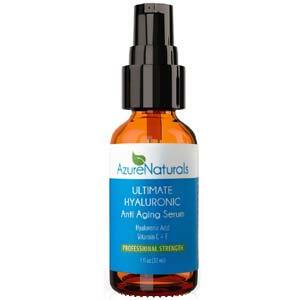 Azure Naturals Ultimate Hyaluronic Anti-Aging Serum has an official website that is pretty informative. It describes how the product is meant to work and provides the full ingredient list. 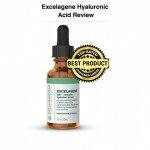 While no documentation proving this particular product’s effectiveness is readily supplied, it contains the clinically proven humectant, hyaluronic acid, which is known to provide extreme hydration that fills in fine lines and wrinkles. 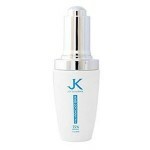 It also contains effective moisturizing botanicals and protective antioxidants. Azure Naturals Ultimate Hyaluronic Anti-Aging Serum’s ingredients can moisturize skin and reduce wrinkles for a soft, dewy look. It also contains natural brighteners like vitamin C and antioxidant-rich ingredients that protect the skin from sun damage. All the ingredients are sourced from nature, even the preservatives. You can purchase this product through the manufacturer or on Amazon. However, it is unclear if the company’s impressive guarantee applies to products purchased via Amazon. There are many anti-aging serums available on the market, so please consider all options before making a purchase. Azure Naturals provides a year-long money-back guarantee that even includes shipping costs.